The Directional Gradient will create a gradient along a defined axis. By default the gradient will be generated at the size of your objects bounding box. The midpoint of the gradient is the halfway mark between Color A and Color B.
inbetween the Start and End Range meaning it will change position based on your Start/End Slider Settings. The midpoint will always be located at the 50% mark between the two Colors. 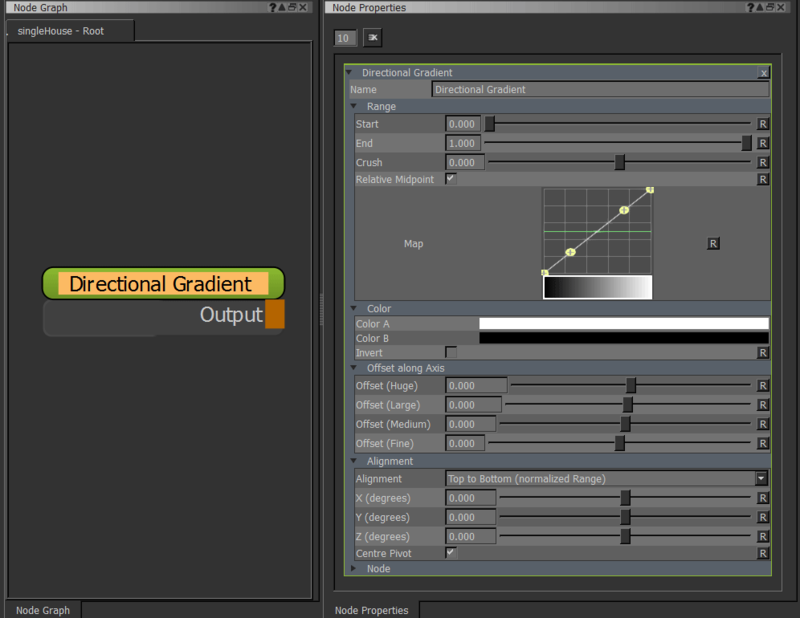 The Offset slider allows you to move the centre of the gradient along the Axis defined under the Alignment Group. The Offset sliders come in different slider ranges however they are all added together to determine the final offset value. The 3 default alignments have a normalized range meaning that they will always cover your object full black to full white by default. The Custom alignment does not come with any preset. Use the X / Y / Z (degrees) Sliders to set the orientation and modify the Range and Offset along Axis Attributes to get a result you like. Allow you to set a custom rotation for your gradient. Please note that these sliders are only evaluated if the Alignment is set to Custom. If ticked on the rotational centre for the X/Y/Z (degrees) sliders is the object centre, otherwise it uses one side of the object's bounding box.